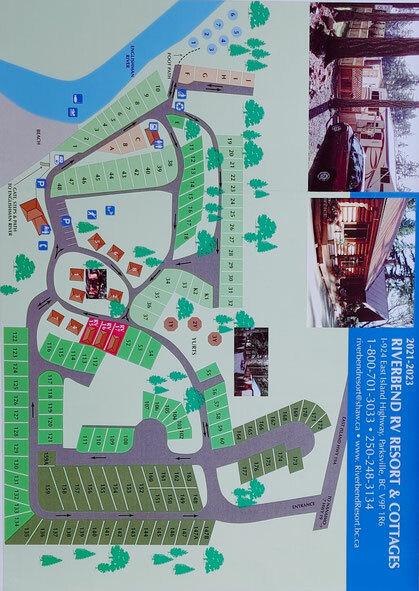 Riverbend Cottage and RV Resort, is on 16 wooded acres along The Englishman River. Located just off Highway 19A at Riverside Road. We are close to Parksville beaches and steps from Rathtrevor and Top Bridge Provincial Parks. Close to 6 golf courses, spas, mini-golf, restaurants and shopping. Riverbend is the perfect spot to launch your exploration of all the natural wonders Vancouver Island has to offer. At Riverbend Cottage & RV Resort we cater to a full range of vacationers by hosting cottages, a campground which includes full-service RV sites, as well as tenting. Our fully equipped cottages and yurts can accommodate from two to 10 people and all of our vacation rentals have indoor fireplaces, outdoor firepits, sundecks, a kitchen or kitchenette, three piece bath, onsite parking, and picnic tables. Over a hundred fully equipped 30 and 50 amp RV sites can accommodate everything from tent trailers to class-A motorhomes. Your well behaved pet is welcome at friendly Riverbend Resort so we hope your entire family will join us in Parksville for the vacation of a lifetime. Tenting is a pleasure in our campground with groomed tent sites located close to the shower house and washrooms as well as tenting sites along the river. Each tent site has a picnic table and a firepit. You'll be right on the Englishman River where you can swim in both deep and shallow swimming holes - hours of fun for both young and old. The fishing is great and if you feel like a walk, sandy Rathtrevor Beach is only minutes walking distance away.